We can help you reach more homes and more customers in Carmel, Mahopac, Brewster, Southeast and Patterson. Call 845-225-4726 and Joan Byrnes can assist with your advertising needs. Or, email ads@pcnr.com or PCC Editor Doug Cunningham personally at doug@pcnr.com. • All copies are either subscription or newsstand sales: We are a paid, wanted medium, not a throw-away publication. 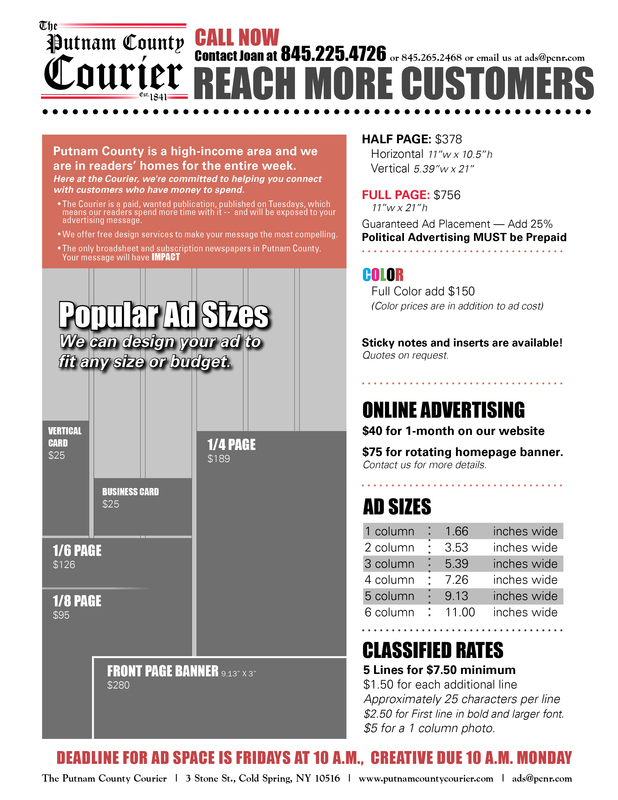 • We are the only local broadsheet-sized paper in Putnam County; more impact for your message. • Paper of record: Legal advertising for all customers (LLCs, banks, self-storage businesses, etc).